Scene from Crossing, an opera by Matthew Aucoin, at the Brooklyn Academy of Music. Photo by Richard Termine. Crossing, commissioned by the American Repertory Theatre, was premiered two years ago at the Shubert Theater in Boston, but it seemed fitting that the work should migrate for its second production to Brooklyn, Whitman’s old stomping grounds. The appeals of Aucoin’s Whitman gained in immediacy and urgency through this local connec­tion, which linked the audience to the historical Whitman. Location became the means to collapse distinctions of time: Whitman himself had been an opera lover and according to John Townsend Tronbridge, even claimed that “but for the opera, I could not have written Leaves of Grass.” The character’s appeals to the audience to dissolve distance of time and space because he had “sat where you sit” and “breathed the air you breathe” was thus specific both to Brooklyn and to the theater. 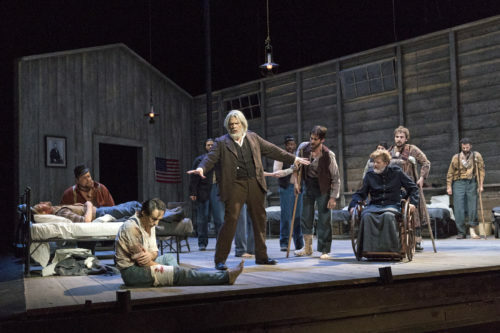 The Civil War setting was also ghoulishly able to bridge historical distance: the Brooklyn perfor­mance was just months following the events in Charlottesville, Virginia. Having been written in 2015, Aucoin’s and director Diane Paulus’ vision of a nineteenth-century America at war seemed there a prescient image of the divisions of 2017. The staging encourages this interpretation. The cast was in nineteenth-century garb for most of the opera but were transformed into twenty-first-century men in the last scenes. The ghosts of the Civil War walk among us. Crossing featured a cast of four leads, ensemble, and dancers; the pit was staffed by the young and increasingly renowned chamber orchestra A Far Cry. Aucoin conducted the ensemble himself. Rod Gilfry, who portrayed an intense Walt Whitman, performed with professional aplomb, sustaining a role that scarcely allowed him a moment out of the spotlight. For me, though, the vocal and dramatic highlight of the performance was Davóne Tines, who played Freddie Stowers, a runaway slave and Union soldier. (Tines is a co-creator and vocal lead of the American Repertory Theatre’s next opera commission, The Black Clown, by another young composer, Michael Schachter.) In Crossing, Tines’s powerfully resonant baritone voice was wielded in the service of a complete transformation into character in voice, gesture, and facial expression. I was especially struck with Tines’s knack for ringing out music from the sounds of language itself. He lyrically declaimed the text, finding sound worlds within each vowel to create wonderfully complex layers of timbre. Aucoin’s decision to finish Tines’s first aria in falsetto was a clever idea, and beautifully executed in performance. Tines’s transition from a deep, rich resonance to crystalline strains, breaking under the weight of sorrow, was the single most powerful moment of the show. There was only one female role, that of a messenger reporting the end of war, sung by soprano Jennifer Zetlan. Zetlan sang admirably, but the brief inclusion of a female voice in an otherwise all-male vocal production was for me confusing and unmoti­vated. Instead, I think that a more ascetic all-male vocal cast could have lent a powerful insistence to the show as a whole. Aucoin, trained as a composer and poet, wrote both music and libretto for Crossing. Aucoin’s idea to imagine Whitman struggling to understand and reconcile his poetic persona with his experiences in the real world was an interesting one: in his libretto Aucoin strives to depict “the man himself” rather than the man formed on the page in Whitman’s own writings. This objective is pursued by means of an amalgam of lines quoted directly from Whitman, many paraphrases of Whitman’s ideas and poetry, original material created by Aucoin, and some arias which set a stanza or two from Whitman. While I understood the textual goals in the abstract, in performance I lamented the scarcity of Whitman’s own poetry. In particular, Aucoin’s rewrites and para­phrases of familiar lines often felt unnecessary and invasive. For example, the opera opens with a short direct quotation from the middle of “Crossing Brooklyn Ferry,” “What is it then, between us?” But then Whitman’s mellifluous and cadential “It avails not, time nor place—distance avails not” is blunted to “Since neither Time nor Space can keep us apart.” In all, I wondered why Whitman was not given more air time to speak for himself using his own words. Musically, Aucoin is at his strongest as an orchestrator. Using a neotonal harmonic language, Aucoin combines the luxuriant textures and progressions influenced by the chromaticism of late-Romantic maximalism and, to cut that richness, the layered ostinatos of late twentieth-century minimalism. The effect of this writing is cinematic and accessible: a kind of John Adams meets Thomas Adès meets Howard Shore. The sonic surface of Crossing is lush, layering figura­tion and textures across the ensemble and conjuring a symphonic illusion from the smaller forces of the chamber orchestra. Aucoin was less successful in creating memorable musical material in the moment and form at longer temporal spans. For this listener, his writing appealed mainly to the sensuous immediacy of ravishing aural impact, which though attractive on one level felt for me a bit tiresome over the duration of the entire opera. Generative musical materials could indeed be recognized in their return and re-use, which effected a kind of unity over the course of the work; but these materials in my opinion were too intrinsically weak to sustain interest across the form as a whole. With the grave themes that Crossing raises, and with the live emotions of a fraught political climate, the opera cracked under the weight it took on but could not quite support. Likewise, I left the opera with a good idea of what composers Aucoin admires—I heard the sonic footprints of Strauss, Britten, Debussy, John Adams, and Thomas Adès—but with less of an idea about what makes Aucoin himself as a composer. Of course, emulation, paraphrase, modeling, and even copying is how a composer develops his or her own voice. This is the case now as it has been for hundreds of years. Crossing was premiered when Aucoin was twenty-five years old. No doubt the experience of writing Crossing for such a high-stakes production will contribute to his skills as an operatic composer in ways that might not yet be measurable. Perhaps I will be able to find “Aucoin” in Crossing retroactively as he adds to his corpus and develops his voice in the future. Indeed, recognition of the unique voice of a composer in a young work might only ever be possible in retrospect, only after we have a sense of that voice and style in the “mature” works that evince and define it. Certainly this is one way the early works of past composers in the pantheon of classical music are often understood. We take joy in recognizing Mozart, or Beethoven, or Mendelssohn in their early works, similar to the pleasure we take in recognizing the face or disposition of a friend or family member in a youthful photo. At the same time, it seems that there ought to have been something special already in those early works, somehow presaging future developments: it is the early works, after all, that put a composer on the map in the first place, that open the door to future successes and artistic maturity. I had the opportunity to further muse on questions of youth, composers, and retrospective listening through two concerts in Boston this past November. The first paired Ludwig von Beethoven’s Piano Concerto No. 1 (also written at the age of twenty-five) with Josef Anton Bruckner’s Symphony No. 4, performed by the Boston Symphony Orchestra. The second was a concert performance of Handel’s first opera, Almira written by a nineteen-year-old Handel and performed by the Boston Early Music Festival at Jordan Hall. Beethoven’s Piano Concerto No. 1 in C major was crafted in 1795, three years after the young composer had arrived in Vienna from Bonn. Though published as his first concerto, it was his second: the B-flat concerto (published as No. 2) over which Beethoven toiled for many years was begun in Bonn around 1787. Compared with the B-flat concerto, the C-major feels effortless, blending Mozartian elegance, the pointed wit and wisdom of Haydn, and all the jaunty confidence of a young virtuoso. The BSO and music director Andris Nelsons, recently returned from a tour in Japan, were joined on November 21 in Boston’s Symphony Hall by Austrian pianist Rudolf Buchbinder for a delightful interpretation of this work. Buchbinder and Nelsons made a charming and congenial pair: Buchbinder, a wizened figure hunching slightly over the keyboard, his fingers seeming barely to graze the keys; Nelsons, a jovial and commanding presence, seeming to have a ball onstage. I admired the approach of the orchestra to the concerto; it did not feel like they were merely accompanying a soloist but rather providing an organic framework for the commentary and virtuosic finger-work of the piano part. This gave the performance an easy and jazz-like improv­isatory feel. From my vantage point in the first balcony on stage right, I enjoyed the contagious sense of fun radiating from Nelsons. His gestures seemed to me irresistible invitations to participate rather than the kinds of imperious commands of so many other conductors. There was one moment when Nelsons and the BSO perfectly caught Buchbinder’s timing at the end of a section of triple trills and cascading scales; Nelsons caught Buchbinder’s eye in that moment and looked like he was almost going to shout for the glee of it. Buchbinder particularly shone in the second movement. An elder eminence performing the emotional outpourings of a hot-shot virtuoso, he approached the slow movement with quiet patience and sensitivity, mustering a wide palette of sounds. I often listen to early Beethoven on fortepianos (there is a particularly beautiful recording on fortepiano of this concerto by Arthur Schoonderwoerd and the Ensemble Cristofori on the Alpha label), and so a nine-foot Steinway Model D can some­times sound a bit clumsy and percussive to me; yet Buchbinder used the magnificent machine to project muscularly over a large modern orchestra in a big hall without sacrificing any of the delicacy and clarity for which I often turn to the fortepiano. In the last movement, a cocky and brilliant rondo, it took a little while for the orchestra and soloist really to come into sync, but in the end, the finale came off with great panache. This movement unrelentingly shifts the metrical accent to the point of being impertinent, and one can almost imagine the young Beethoven thumbing his nose at the audience, daring us to call him on the prank. All in all, this was one of my favorite performances of the past year. I realize that some of my pleasure in the concerto derives from construing it in the context of Beethoven’s biography; perhaps I even feel relief and gratitude that this period of his life seems to have been free from the kinds of sorrow he would experience later in his deafness. Of course, this is an act of imagination on my part. Does this work in itself really possess a “youthful” exuberance? Does it provide evidence of a happier time? Who knows if the young Beethoven would have responded affirmatively to such questions, but my own feelings of personal attachment to the figure of the older and more tortured Beethoven encouraged me to listen empathetically. In the performance the evening of November 21, the symphony did emerge as the sun at dawn in the opening of the first movement. Barely-audible tremolo strings created a halo for the opening horn calls that herald the symphony. The first movement as a whole, however, I felt, was a bit uncomfortable: Nelsons seemed slightly nervous, and I did not perceive full commitment and unity of intent from the orchestra. Bruckner’s massive forms have always perplexed me, and the correspondingly heavy mass of each formal constituent poses real challenges in performance. Indeed, in this performance my biggest complaint was that that sections often felt boxy; while the sections themselves were played beautifully, transitions and elisions into subsequent units felt unnaturally abrupt. The rapport of trust and generosity between Nelsons and the BSO is a beautiful and rare one, but I wonder if in this instance, a bit more coordination or verbal instruction from Nelsons in rehearsal could have achieved a more coherent interpretation. I would have liked to have returned to subsequent performances to see how this movement evolved. The second movement was very strong: the cello and viola sections gorgeously painted the long mournful melodies with rich and languid tone and solid intonation. The scherzo movement, described by Bruckner as a hunt, was a bit harried in the beginning (the horns were not exactly in tempo nor together), but as the winds joined in, a groove coalesced and the movement finished with brilliance. The finale was the most effective and cohesive movement of the Bruckner that night: at last I felt that Nelsons and the orchestra found their stride together. The results were arresting and terrifying in the best possible sense. I very much look forward to the next Bruckner installments in the BSO’s calendar. On November 25, the Saturday after Thanksgiving, Boston Early Music Festival presented a concert version of Handel’s Almira at Jordan Hall. Produced by BEMF as a fully-staged production in July 2013, Almira is Handel’s first opera, written for Hamburg when he was nineteen years old. When Handel arrived in Hamburg, he started out playing violin at the back of the orchestra. Eventually his abilities as a composer became known, and Almira was written when Reinhard Keiser unexpectedly pulled out of writing the score after preparations for the set and costumes were already well underway. It was the chance of a lifetime. Unlike his later London operas which were Italian opere serie through and through, Hamburg operas mixed influences from both French and Italian opera together with German popular song. The libretto is in German and Italian: all the recitatives and many of the comic songs are in German, while the serious da capo arias are in Italian. Incorporating the comic elements from the Singspiel tradition, the opera gives audiences the chance to experience a side of Handel that would have been out of place in the later serious operas: humor. Almira is Handel’s only Hamburg opera to have survived. Many of the singers for this concert performance of Almira were veterans of the BEMF production in 2013. Then as now, however, the artist initially hired to sing the role of Almira did not appear. In 2013, soprano Veronica Cangemi was replaced by Ulrike Hofbauer due to visa troubles. This time, German soprano Dorothee Mields was to sing the title role. Though I was disappointed not to hear Mields (one of the great early-music sopranos), Sherezade Panthaki made a regal Almira, excelling especially in lament arias through her depth of tone and patient, supple lyricism. This created a pleasing contrast with Amanda Forsythe, who portrayed Edilia with a lighter, clearer, and more piercing voice. Forsythe’s coloratura in the arias “Proverai” in Act I and “Der Himmel wird strafen” in Act II was effortless, her ornamentation imaginative, and her intonation fiercely pure. Teresa Wakim (Bellante) united the timbral poles represented by Panthaki and Forsythe and supplied elegant interpretations in her arias. On the men’s side, Christian Immler’s performance as Consalvo was for me most enjoyable: his impressive vocal control in his several bravura arias was matched by a gracious deportment and natural acting talent. The libretto of Almira by Friedrich Christian Feustking is a typically convoluted plot full of pairs of lovers, misunderstandings, and long-lost relatives. A fully-staged production involves dance, spectacle, and a duel—this is clearly an opera for popular entertainment. Like his later London self, the teenage Handel was already able to write appealing, accessible music without sacrificing depth or quality. This early opera does not contain the same impeccable consistency of craft when compared to the kind of command with which Handel penned his operas in the 1720s; yet there are some real gems in Almira. Handel himself knew this, and as an older composer he mined material from Almira. One of Handel’s all-time big hits, “Lascia ch’io pianga” from Rinaldo, originated as an instrumental sarabande in Almira. The nineteen-year-old Handel was also able to make some innovations in Almira. For example, the fake-out reprises of the slow dotted section at the end of the fast fugal section of the overture play with the ambiguities of two different types of French overture (the two-part slow–fast and three-part slow–fast–slow types). This may not sound like rocket science, but it was a new idea at the time, and the effect remains surprising and rhetorically brilliant today. Almira contains the only known breakup duo in a Baroque opera, “Ich will gar von nichtes wissen,” between Edilia and Osman, a genius double recitative between the same two characters in Act II, and a rare vocal quintet which closes the opera (sadly lost as a whole, but an ersatz composed by Stephen Stubbs was performed based on fragments that survive). The orchestra, led by concertmaster Robert Mealy, was a powerhouse ensemble and played with rousing flair. Tempi were brisk, and the push and pull of rubato were frequently used to heighten dramatic effect. With such an all-star band, it was a shame that some basic balance issues had not been worked out. The four plucked strings took up fully a quarter of the stage in an ensemble of twenty-eight musicians, pushing the bowed basses toward the back of the stage. This resulted in the absurd aural effect of the baroque guitar and the right hand of a harp consistently over-balancing the bowed continuo instruments. If this had been a special color used once (or twice), that would have been one thing. But for most of the recitatives and continuo arias I could barely hear any bass at all, whether from the viola da gamba or cello. As readers will immediately realize, this configuration meant that fully half of Handel’s part-writing in such movements was unheard. This was particularly a shame since cellist Phoebe Carrai, one of the world’s most brilliant continuo cellists, was performing that night. Despite this, it was a treat to have an opportunity to hear Almira live, and it is a credit to BEMF that under-performed stage works are brought to the attention of the public to consistent acclaim. Although it was a concert performance, the solutions worked out to incorporate some limited staging along with the acting of the singers brought the dramatic aspects of the opera to life. I left Jordan Hall that night with a new fondness for the young Handel and a curiosity about his early works and his development as a composer. Before the performance, scholar Ellen T. Harris had told a story about Handel and this opera. During the time when he was writing Almira, Handel had refused to give up his seat at the harpsichord to the more senior Johann Mattheson. Mattheson challenged Handel to a duel and would have wounded Handel, but for the fact that something deflected the strike. According to Handel, what caused this deflection was a score which he kept in his breast pocket. In Harris’ retelling, Almira was the score Handel was toting around in his coat pocket. Early works are thrilling not necessarily because they are a composer’s best works—indeed, few early works really are—but because so much is at stake in them. With historical perspective, they can seem to disclose a genius in the making, someone whose future thoughts could illuminate the imaginations of ages should he or she be given a chance. And should these individuals catch the public eye at just the right moment, they might avoid humankind’s ordinary fate of obscurity. Early works have the power to transform a life. In Handel’s case, Almira saved his own. “Reminiscences of Walt Whitman,” The Atlantic Monthly, February 1902. Boston Symphony Orchestra (2017). Andris Nelsons Speaks with Brian Bell. [podcast] BSO Beethoven and Bruckner Program Podcasts. Available at: https://www.bso.org/Medias [Accessed 28 Nov. 2017].